There’s a surprising peace surrounding Port Arthur. Maybe it is the energy coming off the tall silver poplars, oak trees, and horse chestnut beginning to light the grounds in a halo of yellow. Or the English gardens, framing crumbling sandstone buildings set against a brilliant blue sky. Or maybe it is as I suggested a sense of my spirit returning home, as a few people in our group were not feeling the same Zen. You know, past lives and all that. 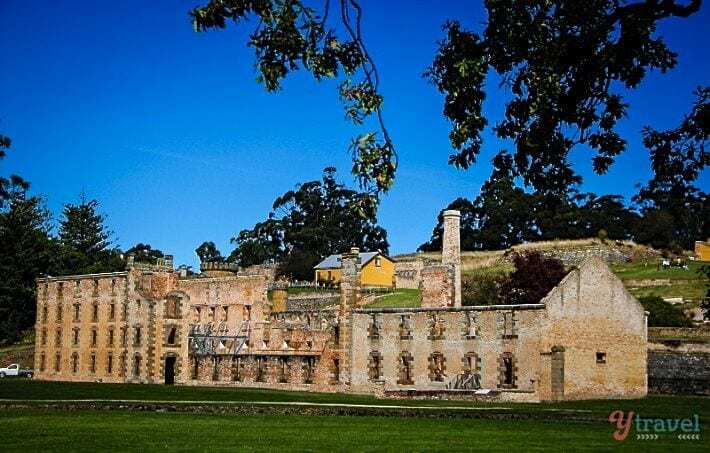 Port Arthur is one of Australia’s most notorious convict prisons. 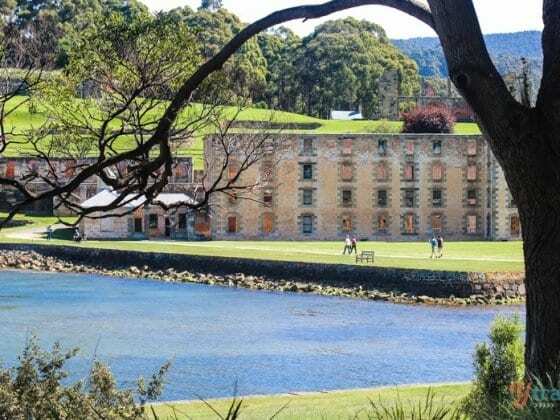 Unlike Norfolk Island, the place of the direst punishment—300 lashes compared to 100 at Port Arthur—it was a prison aimed to help prisoners reform. On one hand – the good one – there was the option to learn a trade and have a reduced sentence due to good behaviour. Those were the prisoners labelled the incorrigible, the ones who had a chance for a better life. 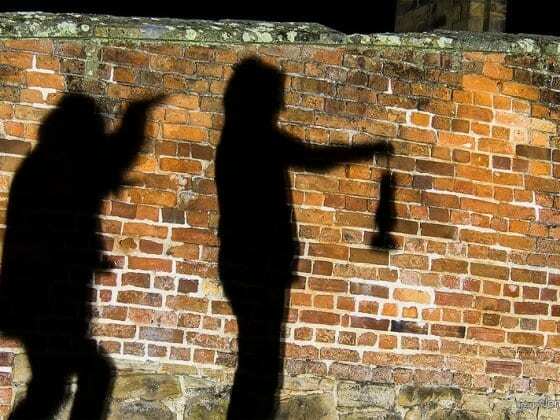 On the other hand – the naughty ones – were the incurables – the repeat offenders, who chose longer sentences, hard labour, and cat-o-nine whippings instead of freedom. It was all a matter of choice. Port Arthur operated as a prison for 47 years. It began in 1830 with only a small number of prisoners, which during its heyday swelled to 1200. The penal station was established as a timber-getting camp, using convict labour to produce sawn logs for government projects. 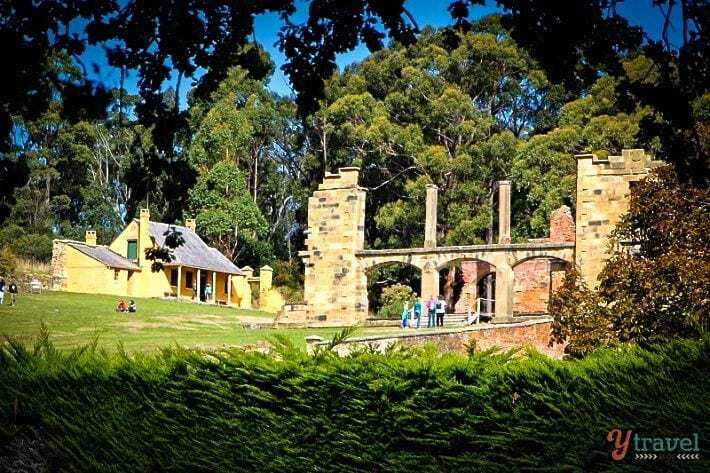 Port Arthur was not just a home for convicts, but a settlement for soldiers, free men and their families. There were no fences surrounding the penal buildings and within the grounds were also homes, gardens, schools and parties and regattas held and enjoyed by those who chose freedom. By the end of its story, Port Arthur had slowly degenerated into a home for the elderly and the crazy. The eldest prisoner to die there was in his nineties. Some incurables had served 47 years without an hour of freedom—poor decision makers. After years of punishing the physical bodies, the powers to be realized physical punishment did do nothing else but embitter the prisoners. New styles of reform were introduced which involved the mind: solitary confinement, or in gentle terms, the space to silently mediate upon your sins in order to do better. I believe in the power of meditation, but not in the darkness alone for 30 days. Welcome to cookoo land. We were told all these fascinating stories and more by our guide Colin, who really made Port Arthur come alive. His ability to sprout of historical anecdotes and facts and figures astounded me. Now only 20 minutes after the tour I can barely remember the name of the Lieutenant who ran the prison efficiently—oh yeah. His name was Lieutenant General Arthur. Opposite us, on the hill stood a pumpkin-coloured cottage – the most haunted house in Australia. Colin has not seen the ghosts himself but has felt them, so eerily close to him that he moved out of that house as quick as his legs called carry. I was shattered that we were pushed for time and could not venture in to catch the ghosts ourselves. But, you always have to leave a reason to come back to special places like this World Heritage Site. There are also introductory tours of the settlement, which may be less thrilling, but equally enjoyable and interesting. 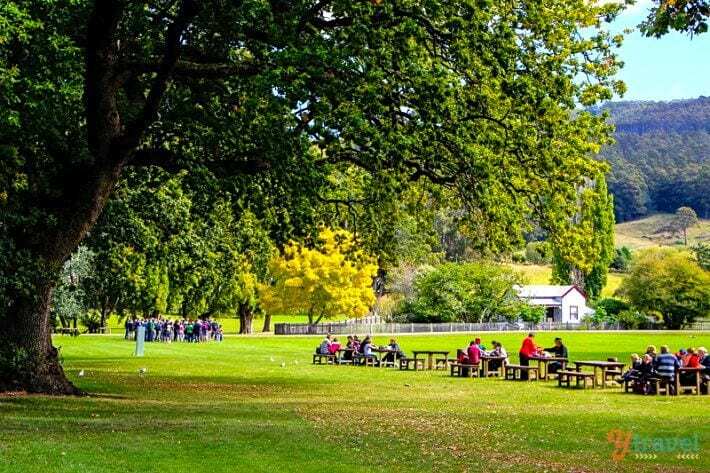 Port Arthur is the perfect place to stroll amongst the sprawling fields and English gardens, the historic buildings, and along the water to learn more about our unique and colourful history. It’s a history that Australians have tried to hide for years. Who would want to claim a DNA chain blood-stained by murderers and thieves and the lowest forms of society? I like to see it as a history that has shaped the strong character and identity that we as Australians have now: Hard workers, who believe in helping the underdog, sticking together and defeating the odds. I’m proud of our roots and how far we’ve come. There is a lot to be celebrated in that. Where once being sent to Van Diemen’s Land was a punishment worse than death, we now have people lined up daily with wads of cash to pay for the opportunity to set foot on this harsh land for the chance at a better life. It’s all a choice remember. Port Arthur reminded me of that. The choice of life behind the prison walls, or of the freedom granted to you by the breeze blowing outside your cell? That is where the peace lies. Have you been to Port Arthur? Do you feel it is possible to feel peace at a place that has a traumatic past? 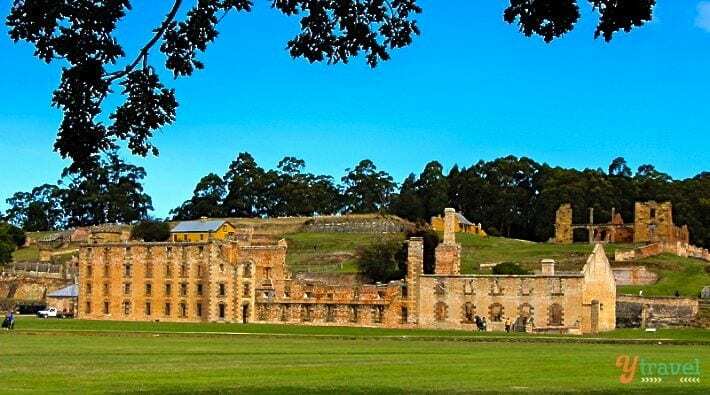 Years ago I visited Port Arthur and I was impressed with the beauty of the place but a tour guide would have made a big difference. Your blog has made the place come alive. Just curious why you didn’t mention the Port Arthur massacre? Didn’t they talk about that on the tour? Great question Zoe. I deliberately didn’t mention it. Before we went on our tour we were asked by our hosts not to mention the massacre. Many of the people working at Port Arthur were affected by it and don’t like to talk or be reminded of it. I wanted to maintain respect for these people. I also think people who commit such horrifying deeds don’t need to get any airtime. Totally agree Caz. 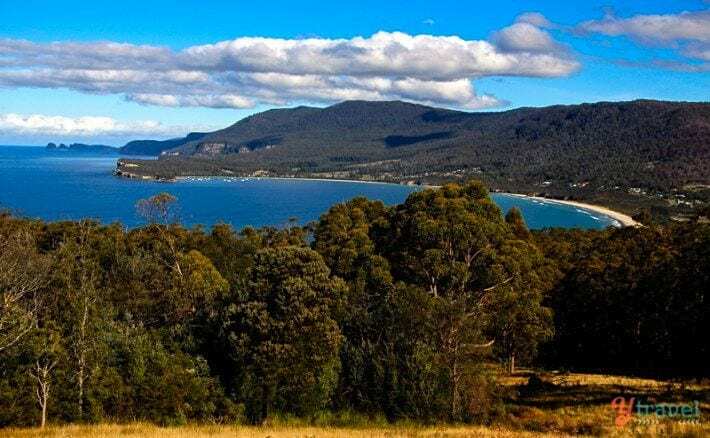 Port Arthur has a rich history and beautiful setting and deserves to be remembered for those characteristics rather than recent events. Wow you got a nice sunny day at Port Arthur. I also visited. I spent the whole afternoon and had the place all to myself. I also did the ghost tour, and it is a very sad part of Tassie history but nevertheless, as so many places, it is what it is. I found the stories fascinating especially the ghost stories. I would love to take part in the paranormal tour but it only runs once every few months so was not able to participate, but the drive to Port Arthur was gorgeous and unforgettable. I can still see it in my mind. Thank you Jhon. 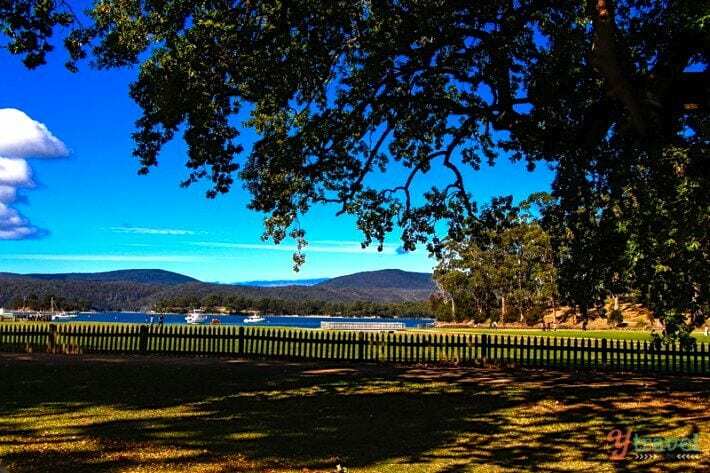 I think for a place with such rich history as Port Arthur a guide is a great idea. I tend to not pay attention if it is left to me to discover the stories, I find guides so much more engaging and bring the place alive. 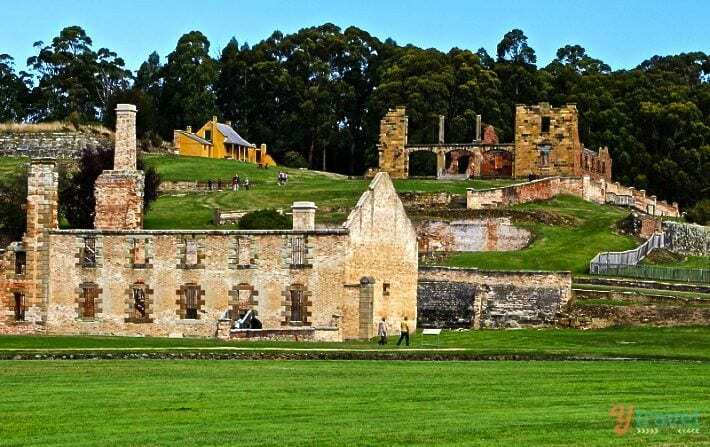 What an amazing place Port Arthur is, and Tasmania overall! I’ll definitely be heading back with Flick at some point. We visited for 5 wonderful days in 2011 (seems so long ago now!) 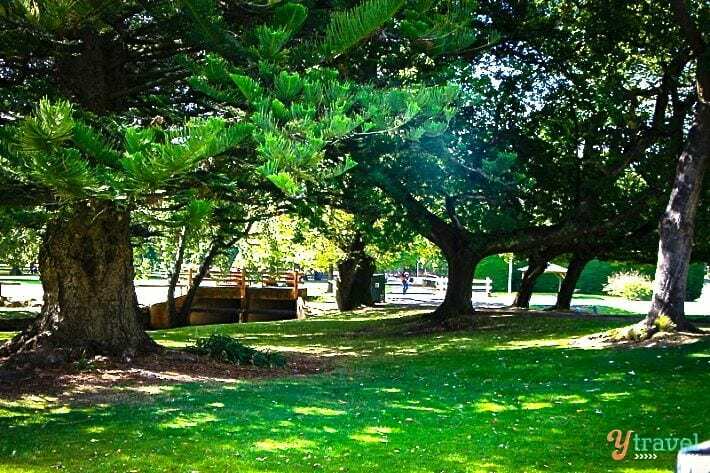 There was a bit of a serene beauty to the place, something contributed to be it’s more recent past as well as it’s place in Australia’s very early history. Took a few photos there, have a look if you want! It seems odd that a place where such awful things took place could give off that sort of vibe, however I felt something similar when I went to Auschwitz-Birkenau. A calmness and sense of solidarity (or perhaps reflection) that seems to wash over everyone who visits.